MAGAnomics | What Does MAGAnomics Mean? The term MAGAnomics refers to President Donald Trump's strategy for improving America's economy. 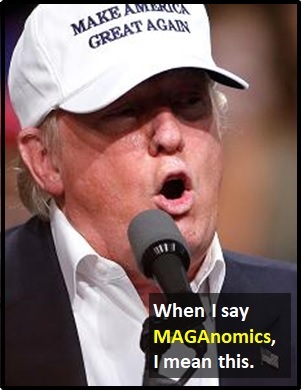 The first half of the word, MAGA, is an acronym (Make America Great Again), while the second half of the word in borrowed from "economics". The term MAGAnomics is a TRUMPISM. The overarching aim of MAGAnomics is to sustain economic growth at 3%. Person A: According to the Trump administration, the proposed budget and domestic policies under MAGAnomics would boost economic growth to levels not seen in decades. Person B: That sounds as about as credible as the "wall" promise.